Grandpa, Grandfather, Pop Pop, Granddad, Gramps…. In our house, my father is “Bumpa” to my son. And, in my son’s eyes, Bumpa makes the best waffles. Ever. Nothing compares to Bumpa’s waffles. Of course, Bumpa’s waffles are full of milk and gluten and eggs. And love – the love of a grandfather that indulges every desire of his one and only grandson. I’m not sure I’m ever going to manage to come up with something that beats that. But, I did manage to come up with something that is a close enough approximation to keep my kiddo happy in between visits to Bumpa’s house. As a bonus, my son says they’d make great “bread” for peanut butter and jelly sandwiches, too. Whip the egg whites until stiff peaks form. Set aside. In a large bowl, mix the egg yolks, milk, coconut oil and maple syrup. Mix the dry ingredients into the wet ingredients until no lumps remain. Fold in the whipped egg whites. Cook according to your waffle iron specifications. I really must get a waffle iron. . . recipes like these make me wish I had one, and waffles are so much easier than pancakes! Really? You think so? I think pancakes are way easier, but that’s partly because I loathe washing the waffle iron. I have not been farther than the first page on your blog, and I LOVE it! These gluten free recipes look amazing! I’ve got to get myself to the store and get some of that sorghum flour! These look wonderful, and you’re right, the proportions are similar to the ones I make. I’ll add them to my list! I had a bompa, because we are Belgians & we live in Flanders. 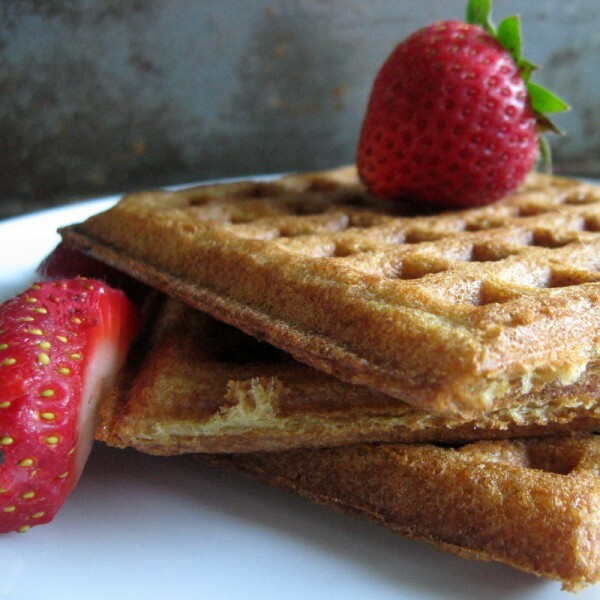 Your dairy free & gluten free waffles look just the best ever!! I made them today & i was pleaently surprised!! MMMMMMM,…a real delight! Thanks Sophie! I’m glad you tried them and liked them! Awesome! These were the best waffles I’ve made in a long time. Used corn instead of arrowroot starch. Spelt flour might be a delicious alteration as well. Thank you! I’ve found that the starches are relatively interchangeable. Slept isn’t gluten-free. But if that is not a concern it would probably work fine. Just made these again! With a double batch I split the flour between corn meal, sorghum and flax meal. Simply omitting the xanthan gum and less starch made them as light as crepes. We could see through them. These waffles are gorgeous, Deanna! And you have proven once again how much one can say in so few words. Truly lovely.